The healing power of sleep is one of the many benefits of training camp, something we all needed desperately after our all-out assault on Santa Rosa Creek Road and Peachy Canyon the day before. And for the first time in years, I discovered the perfect balance of nutrition to keep me replenished for several hours of riding: electrolyte tablets, taken Noah's Ark style every 90 minutes or so. One of the attractions to participate in a training camp was to increase my weekly mileage, shed some weight, relearn how to ride in a tight group, and see another part of California. The medium mocha tan I brought home was a trophy reminder of the effort, something to impress the wife and kids, and strike fear in the hearts of the winter-pale riding brethren I see on my lunch ride. Shedding weight was a challenge, though, because camp organiser Mike Brown cherished his mid-ride lunch stops. Day Two brought us to the Loading Chute in Creston, where Brent and I shared a turkey sandwich and coleslaw. We were only 30 miles into our 90-mile day, so Jim and Randy kept pedaling, while Skip jawed with a local cycling club at the deli nearby. During lunch, I took the opportunity to ask several of my camp mates what brought them to cycling. 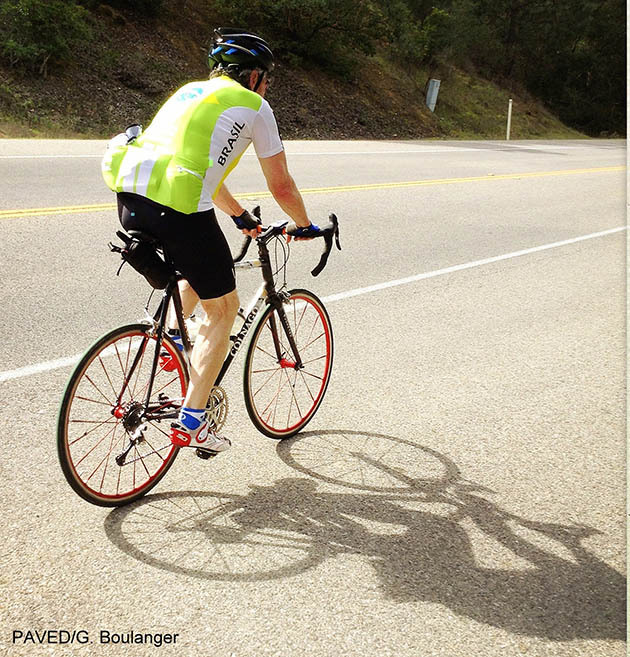 Lewie, 67, is a retired commercial contractor, and began cycling 22 years ago to get healthy. A former inactive smoker and drinker, Lewie regularly rides with groups in Tacoma and tours several regions of Europe with his wife. His Colnago C-50 is one of three from the Italian maker, with several other bikes in his garage at home. John, 69, is the retired CEO of a large Los Angeles YMCA region. An avid runner up until the early 1980s, John graduated from college on a Friday in 1970, got married the next day, and two days later began a 43-year career with the Y. He's also a member of a 10,000-mile-a-year club in Tacoma, and keeps an aluminum Torelli with Campagnolo components at his Pasadena apartment. 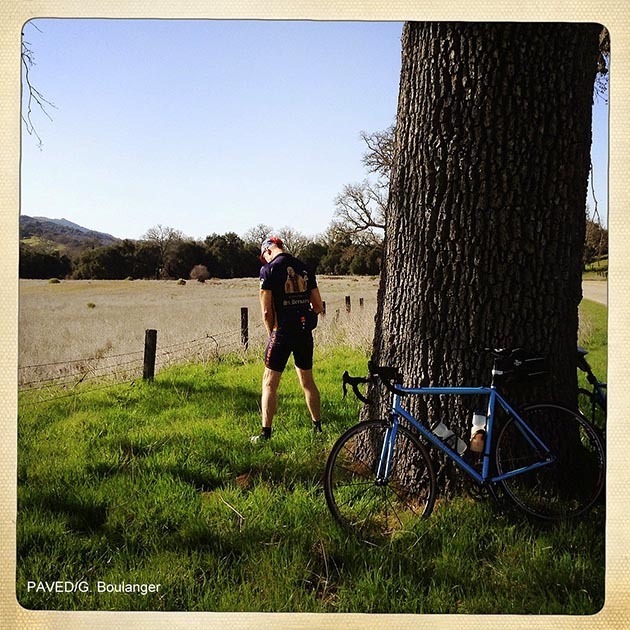 His plan was to ride the Solvang Century the weekend following our camp. Jim, 60, is a retired Department of Defense contractor who's been riding a bike since he could walk, and can't remember a time when he wasn't riding. Like Lewie, Jim also enjoys touring in Europe. He's taking delivery of his new BMC GranFondo GF01 soon. Skip, 69, is the retired captain of the U.S.S. Alabama, the Ohio-class ballistic missile submarine. After serving 27 years in the navy, he trained and prepped actors Denzel Washington and Gene Hackman for their roles on the movie Crimson Tide. He enjoys short rides with long wine-tasting breaks. 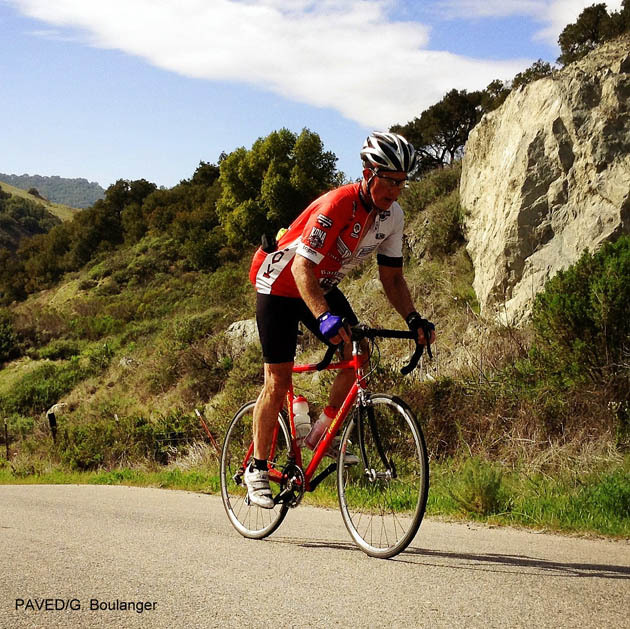 Like Gary, he rides a SRAM-equipped Cannondale. 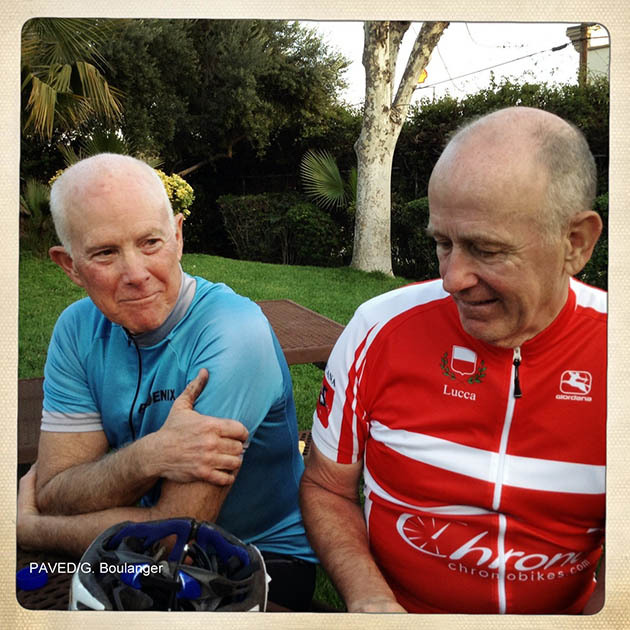 Gary, 71, is retired from Boeing, and like his riding pal Skip, knows his wine and maintains a tight schedule. After lunch, our plan was to make a giant loop around Santa Margarita Lake. Another Washingtonian, Jack, joined us for the day, fresh from a 150 miler near Furnace Creek. 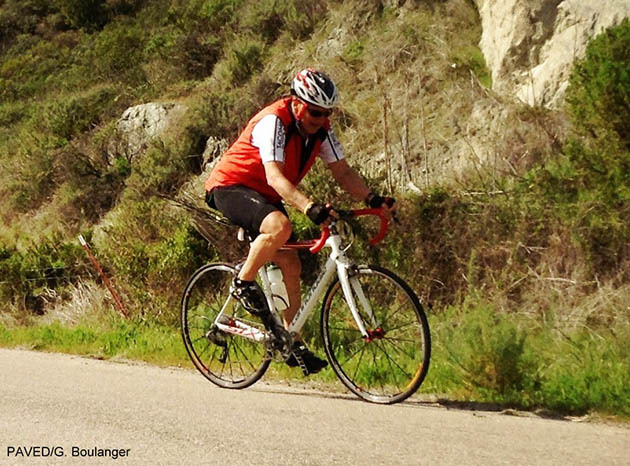 The 64-year-old cycling veteran is a 41-year retiree from the aviation field, and like the others, could spin endlessly in unison. He was riding a titanium and carbon Ritchey Breakaway, something he uses often. He was heading to Texas after our camp. The azure-blue sky stayed unchanged, with puffs of white clouds steaming the sky the entire day. As we would notice every day during camp, turkey vultures, with their ominously curved blood-red heads and ginormous wingspan, would hiss and grunt on the roadside as they pecked apart carion. A turkey vulture raise two chicks every year, which it feeds by regurgitation (gross); it has very few natural predators (too bad), and receives legal protection under the Migratory Bird Treaty Act of 1918. So too does the red-tailed hawk, which we'd see surf the sky alongside our peloton. These are the things one notices during a Gentleman's Training Camp, where the speeds are human and one is able to notice the scenery and terrain. Occasionally one might spot the rare California Steelman bird peeing on the side of the road, so be sure to avert your eyes. One thing we noticed almost immediately on Monday was the frequency of big truck traffic, many of whom would pass perilously close after revving their diesel engines before roaring down the road, a plume of smoke left as a gift of their menacing presence. I was getting a little nervous about Jack, who had a slight aversion to riding inside the white line in front of me and behind Walt, and who was dreadfully hard of hearing. Because Randy and Jim skipped lunch, and Gary and Skip didn't realize we grabbed lunch, our group splintered in several directions. Mike contacted Randy, and we decided to curtail our route to meet them on the east side of Santa Margarita Lake, only after a small group of us grunted up an additional 800 or so feet to meet our thirsty duo, then descend back down to regroup. I was feeling a little tender in my nether region, a result of wearing bibs with too thin a chamois pad, despite a generous helping of chamois cream before the ride. I ended up staying in one place for too long on my saddle, which caused a few arm and fingers cramps. A strong headwind forced our group into several echelons, while Jim was riding up to everyone for a small water ration to quench his thirst. Pam, Mike, and Randy pulled ahead, then YMCA John and I took turns bridging gaps, while Lewie, Brent and Gary brought up the rear. 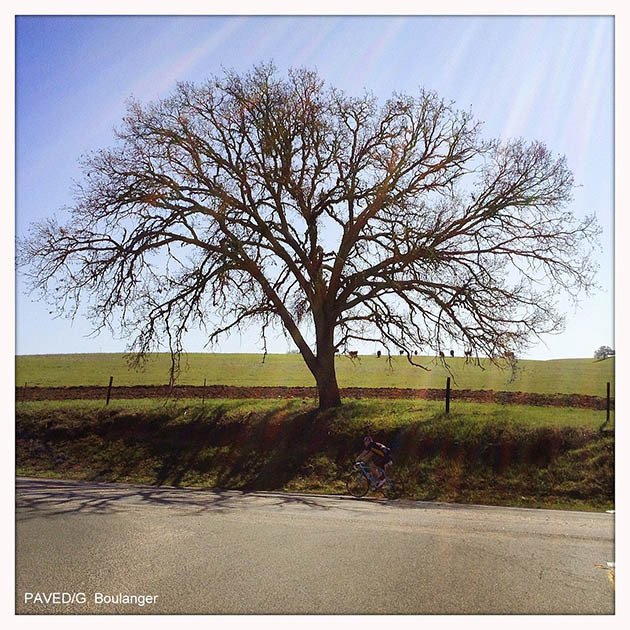 Our vast and peaceful country journey was jolted back to reality once we entered the outskirts of Atascadero, a small town with too many strip malls, big trucks, bike lane debris and stop lights. Our group broke apart as a result, with a near scare coming from a bright yellow Humvee who decided to turn right and stop in the bike lane, a few feet in front of us as rush hour traffic flowed forward. To make matters slightly more interesting, we ran out of road on the east side of Highway 101, opting to ride on Highway 101 for a mile before popping out in Templeton, a saner town void of unruly motorists. From there, it was a handful of low-impact miles to our base. By now Randy was thoroughly famished and itching to get back, so he motored on ahead to grab a football-size burrito and chips, which he generously shared back at the hotel. Jack and Jim had their heads down, chasing Randy, and I had them in my sights. Feeling a burst of energy, I buried myself to catch them, then noticed Mike making his move. I passed him on a sharp and bumpy descent, but the move was reciprocated right at the hotel driveway, a nod to his cagey experience and cunning. All I wanted was a soak in the hot tub, which came after a few plastic glasses of Skip's wine du jour. The rest of us enjoyed a Mexican sleeping pill at the local joint before retiring, this time without television. The day's numbers: 73 miles with nearly 4,000 feet of climbing, and several lungs full of exhaust. Our final day in the saddle would begin with a 9-mile climb on Peachy Canyon Road. I was starting to dig this training camp life.